Aishwarya Rai is making her comeback on the silver screen with Sanjay Gupta's highly-anticipated film 'Jazbaa'. Aishwarya who was last seen on the big screen in the 2010 film 'Guzaarish', and took a break to have a baby, has stayed away from the cameras as much as possible. In November 2011, she was blessed with Aaradhya, her daughter with Abhishek, and since then, many of her fans have been awaiting her comeback. Now her husband is upbeat about her resuming her career: "I'm very excited to see Aishwarya in 'Jazbaa'. It should be a lot of fun. It's a great script. 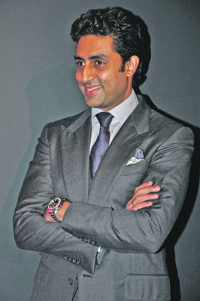 “I love Sanjay Gupta as a director and I think they'll make a fantastic team... it's always wonderful to see her on screen," Abhishek said at an event in Mumbai on 6th January. 'Jazbaa' is an action thriller from the highly-acclaimed ‘Shootout at Lokhandwala’ director and co-stars Irrfan Khan and Shabana Azmi in key roles. Aishwariya has recently confirmed that she has signed several new films, including a remake of ‘Chalti Ka Naam Gaadi’ with Shah Rukh Khan and ‘Ay Dil Hai Mushkil’ which stars Ranbir Kapoor and Anushka Sharma.